Al Noor Island ... art and entertainment hub. Sharjah Investment and Development Authority (Shurooq) has unveiled Al Noor Island, its latest tourism and leisure project, which boasts state-of-the-art facilities and is set to serve as a vibrant cultural and recreational destination for the UAE. The launch was made early last month (May) at the Arabian Travel Market (ATM) at the Dubai World Trade Centre (DWTC). Al Noor Island is located in Khalid Lagoon and is the Arab world’s first island to combine nature, art and entertainment. It extends over an area of 45,470 sq m and reflects the art styles of a renowned designer, who has many outstanding achievements and projects around the globe, such as the Swarovski Crystal Worlds (Swarovski Kristallwelten) museum and the green spaces and several imaginative sculptures at the Schonbrunn Palace in the Austrian capital, Vienna. Construction work on the island is scheduled for completion in the last quarter of this year. Al Noor Island consists of a uniquely-designed, covered and streamlined structure inspired by butterflies’ natural environment, a pedestrian bridge that will serve as an entrance to the island, a Literature Pavilion, a children’s playground and an egg-shaped OVO Art Sculpture. The island is designed to allow visitors to discover natural life over a spacious area that is features innovative lighting. The buildings, walkways, trees and bridge will be lit using advanced technology. 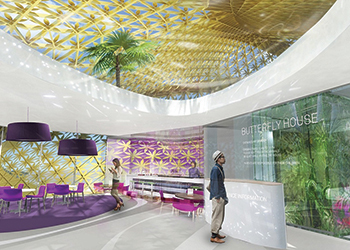 One of the destination’s main attractions, the Butterfly House, is a nature-inspired structure with an ornamentally perforated shadow roof, biomorphic exterior, green light and plant-covered walls. The Butterfly House will host as many as 500 exotic butterflies. On the opposite side of the island, the blossom-shaped Literature Pavilion is an open seating area for writers, intellectuals and book worms. It will be surrounded by striking light reflections of letters from Arabic calligraphy and will be decorated with plush cushions. The island will also host a version of the OVO Art Sculpture, a famous sculpture that has been displayed in major cities around the world.